Why does God allow trouble to plague his people? How can it be considered loving for him to permit trials to run wild in our lives? A slightly-too-exuberant, yet-delightfully-British narrator recounts the changes that resulted from the entrance of a pack of wolves into the eco-system of Yellowstone National Park. It turns out that deer overpopulation had left massive portions of the park barren. Constant grazing had turned valleys into wastelands. The lack of vegetation had caused soil erosion, which destabilized the banks of the river, slowing the flow of water. The lack of sufficient water and vegetation, in turn, forced wildlife to move on. In short, life was fading from the park. Then a pack of wolves moved in. But it turns out that it was the best thing that could have happened. The wolves predictably killed a few deer, thinning out the population. However, that was not the most significant change. The remaining deer were forced to move to higher terrain and abandon the grasslands of the valleys. These areas that had been mown down for so long then began to regrow at an accelerated rate. Aspen trees quintupled in size in less than six years. This growth brought back birds to nest in the branches and beavers to eat the wood. The return of the beavers meant the return of beaver dams, which created pools that allowed for the repopulation of fish, otters, ducks, muskrats, reptiles, and amphibians. The wolves also cleared out some of the coyotes, which caused rabbits and mice to return. This change led to the return of hawks, weasel, foxes, and badgers. Yet the most amazing impact occurred in the river itself. Because grasses were allowed to regrow, the soil collapsed less, allowing for firmer riverbanks. Which gave the river flow greater direction, which reinforced the animal habitats. In short, the entrance of a few wolves created a whole world of good in Yellowstone National Park, transforming wastelands into lush valleys teeming with life. So it turns out that the best thing to do to promote life was to release a few wolves into the valley. Why mention all of these phenomena? Try for a moment to imagine a board meeting where, after hearing desperate pleas for help to save the aspen trees of Yellowstone, a park ranger responded by saying, “I’ll tell you what will ensure reforestation: a few more wolves around here!” Would anyone have taken him seriously? In the same way, I think we would accuse God of being insane if we heard him respond to our cries for greater intimacy with our spouse, greater fruit in our ministries, or greater intimacy with him, by saying, “You want more life? I’ll tell you what will give it: a medical emergency. Or losing your job. Or a car accident.” We would think he’s out of his mind. But search your past and tell me if it isn’t true: Often the introduction of something difficult, and even dangerous, into our lives by the hand of God results in unanticipated, yet undeniable growth. Difficulty brings blessing. Hardship brings joy. Wolves change rivers. This reality does not mean we should court danger. What it does mean, however, is that we should pause before we accuse God of injustice or indifference when he allows hardship to enter our lives. It just might be the best thing for us. In fact, for those who love him, and are called according to his purposes, it will be his working to produce his best for us. James was so certain that the introduction of difficulty into our lives carries the potential to bring blessing that he calls us to rejoice, not only after the trial has ended, but even while we are still in it. Which does not mean we need to pretend that difficulties are pleasant. They are not. Nor does it mean we should not pray to be delivered from, or seek to remove, hardships from our lives. Both are permissible. However, we gain much hope from this realization: Often our loving God sees that bringing something unpleasant into our lives will lead to a thousand good consequences. Therefore, as a good caretaker of our souls, he will allow wolves to enter for a season. So when hardships come, we can cease shaking our fist and yelling at God, and instead lean into him and listen. He is good. He does care. 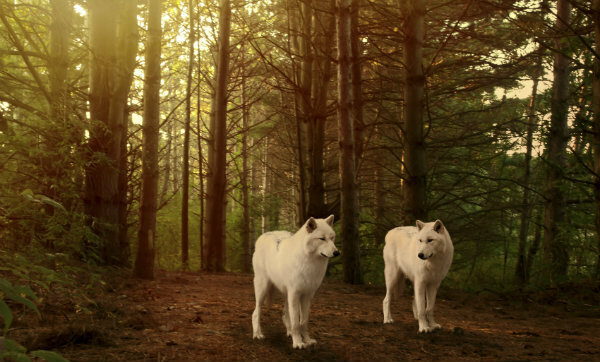 He works all things together for the good of his children — even the arrival of wolves. Categories: blessing, Christianity, difficulty, faith, God, joy, perseverance, Sovereignty of God, surrender, trials, trust, wolves | Tags: blessing, christianity, faith, hope, joy, perseverance, sovereignty of God, trials, trust, wolves | Permalink.